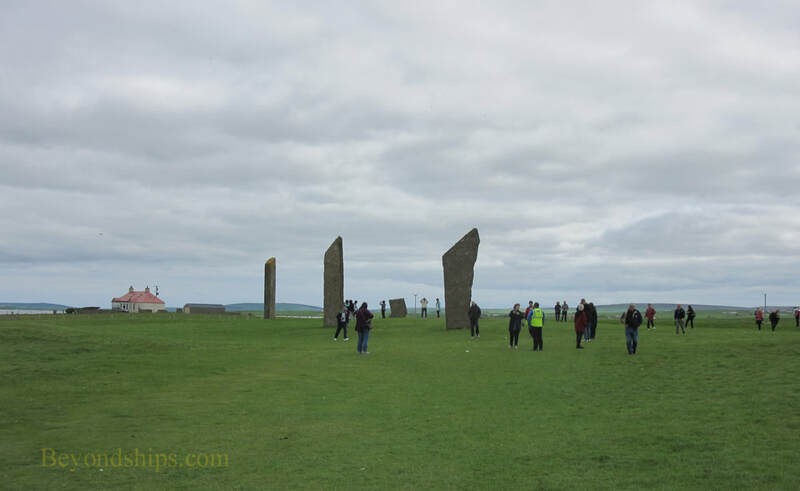 The Standing Stones of Stenness are the remains of a stone circle that dates back some 5,000 years. It may be the oldest henge monument in Britain. 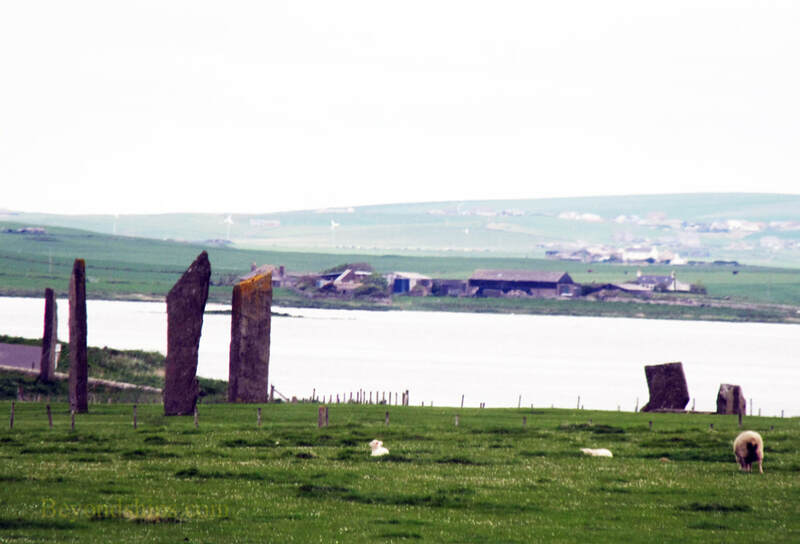 Located on Mainland Orkney, the Standing Stones are on a promontory between the sea Loch of Stennes and the fresh water Loch of Harray. The area around the Stones is rural with few houses in sight. Indeed, sheep graze around the stones, taking only a passing interest in the visitors who come to the site. Originally, the monument consisted of 11 or12 stones set in a circle. Around the stones was a deep ditch that was crossed by a single causeway. Outside the ditch was an earthen bank. At the center of the circle was a hearth. Four stones remain standing. The ditch and the bank are no longer visible. Who built this monument and why. Are unknown It is believed to have been a ceremonial site and down through the centuries, it has been used for various ceremonies by different groups. It is estimated that construction of the monument probably took 50,000 hours. Thus, it would have been a huge commitment for the primitive Neolithic communities on Orkney. 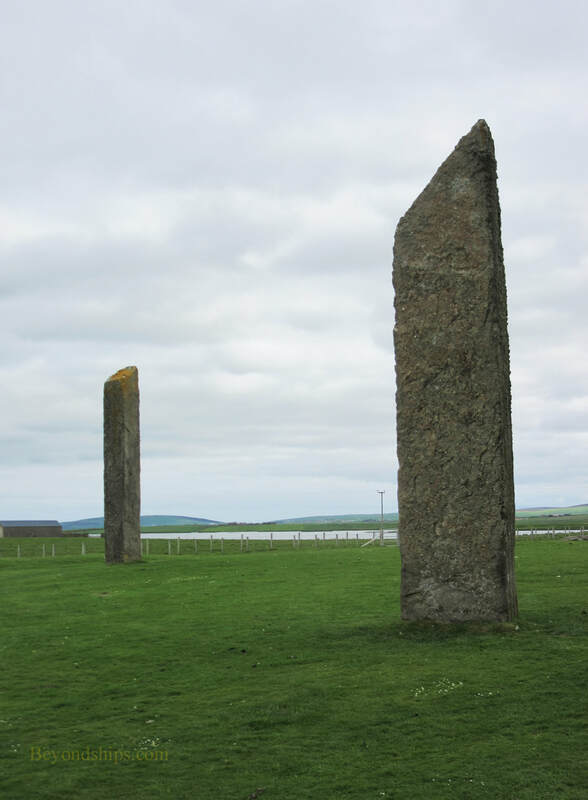 The stones come from various parts of Orkney. They range up to 16 feet high and are about a foot thick. In 1906, a team of eight men using wooden scaffolding, managed to raise one of the stones that had been toppled. That stone had been toppled in 1814 by a farmer who was tired of people coming on his land to perform ceremonies and/or see the stones. He also succeeded in smashing the Stone of Odin, which stood nearby. (That stone had a hole in it and local couples would hold hands through the hole as a sign of their love). Community outrage kept the farmer from further vandalism. There are several other Neolithic sites close to the Standing Stones. An ancient community at Barnhouse Village is only 200 meters away.. Maeshowe chambered carin is about three quarters of a mile to the east and the Ring of Brodgar is about the same distance to the northwest. 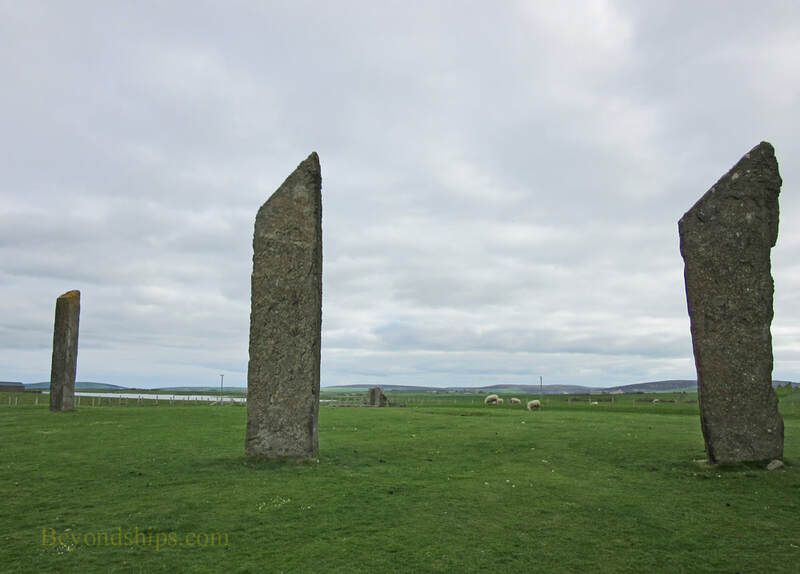 The Standing Stones are part of the Orkney World Heritage site. They are maintained by Historic Environment Scotland. For more information about visiting the Standing Stones, see the Historic Environment Scotland website.